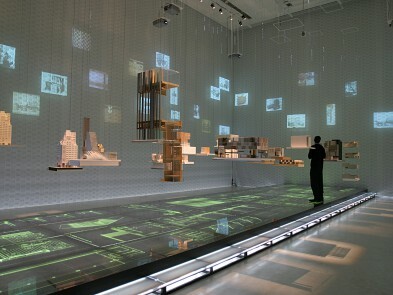 An installation of architectural drawings from numerous Louis Vuitton projects covers the surface of a backlit podium within the triple height space. 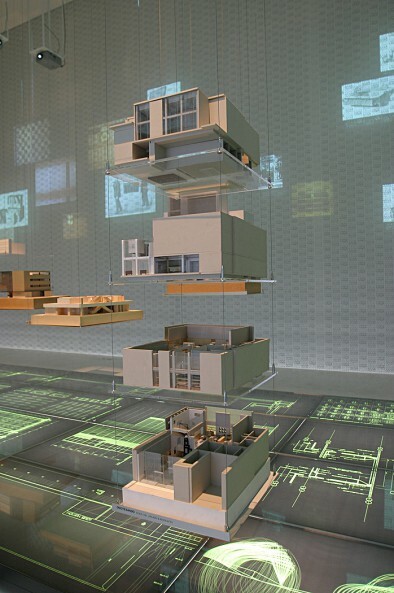 Models of the buildings and prototypes of details and surfaces are hung from the ceiling. Visitors to the exhibition walk on the podium as on a catwalk. Their approach to each project activates a live response of projections on the three triple height walls of the hall and gives information on the history of the project and the associated conceptual referents from the world of LV objects. Curated by Mohsen Mostafavi, the installation evokes activities of the LV world in a state of geographic exchange. Through responsive projections, elements of the history of the company are intermixed with its current preoccupations, its products, and representations of its recent architecture. Visitors to the events are an indispensable part of the performative quality of the projects. 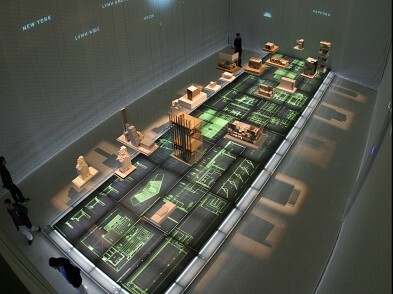 Their interactions with physical objects, models, prototypes and buildings at the two installations provoke programmed responsive projections, which provide information on each project and its material qualities related to LV objects.